Imagine a procedure where the surgeon sees things in 3D, magnified 40 times more than normal, and where the patient can have less pain and faster recovery. 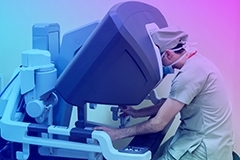 This is the potential of robotic-assisted surgery for many gynecological conditions. Many gynecological surgeries can be performed with traditional open surgery, involving larger incisions, or minimally invasive surgery with several small incisions. Robotic-assisted gynecological surgery is another, newer minimally invasive option for women to consider. The robotic instruments are designed to reach the exact angle to stop a blood vessel’s bleeding. All the robot’s movements are very smooth and precise, minimizing damage to surrounding tissue and organs. Overall, there’s less blood loss and damage to surrounding tissue as well as a lower risk of infection compared to open procedures. Other benefits to the female patient include less pain and a more rapid recovery. Find a physician who uses robotic-assisted surgery near you. Find a Gynecologist near you.